I was 10 years old sitting in front of a television in my home town of Drogheda in Ireland. The program on RTE, the Irish national station was called 'Air Power' about America's military might and the importance of the latest kind of fighter planes. It was November 22nd 1963, 48 years ago today. A world away John F.Kennedy had already made that fatal turn past Dealey Plaza in Dallas to his appointment with death. A few moments later the TV screen went blank and a long silence followed. After about five minutes the scene switched to RTE's newsroom. A newsreader, Charles Mitchell, the Walter Cronkite of his day, came on. He was usually so unruffled and calm and yet ,on this occasion he looked agitated and ill at ease. 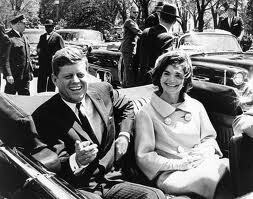 He read a brief statement from United Press International that President Kennedy had been shot in Dallas. I fetched ny father and mother and soon my brothers and sisters joined us. We sat looking at the screen, by now showing footage from President Kennedy's recent visit to Ireland, a week of incredible pride for my nation. Then we switched to BBC and a teary eyed newsreader announced that Kennedy was dead. To say we were stunned was an understatement. How could that vibrant brilliant young shining star be quenched so suddenly? In the long days that followed we felt our innocence had died along with John F.Kennedy. His brief period in power seemed more like an Irish Aisling, the dream poems where lovers conjured up visions of those they lost and loved. Even to this day he holds a place in our memories, he has influenced every leader since, he has become the political icon of our time. Years later I visited Dealey Plaza and the book repository where he had been shot from. It seemed so banal, so small, so anonymous for what monstrous deed had been committed there. But to a ten year old all those years ago, he represented the first intimation of mortality. As the deathbed whereon it must expire."